On top of a hill is a beautiful organic farm with a 360 degree view of the Monte Soratte, Monte Cimino, the lake of Alviano and Castiglione in Teverina. It was once the summer residence of a noble family. Today, the agricultural company has 17 hectares of land between the hills. There are olive groves, fields and woods. There are also many fruit trees including apple, almond, plum, apricot and cherry trees. There are three holiday homes in the agriturismo. 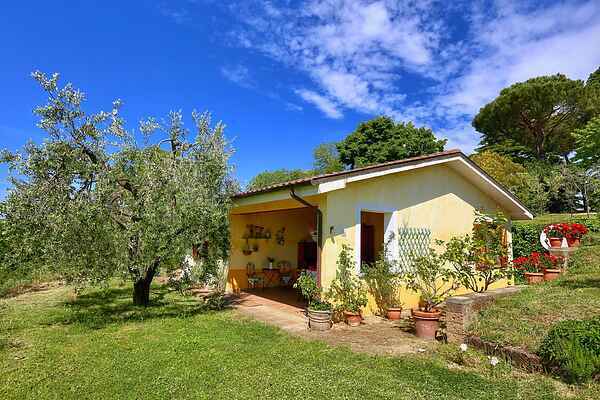 Casaletto Graffi is a nice house with a garden and terrace near the olive trees. In the vegetable garden you can find pumpkins, courgettes, cucumbers, tomatoes, cabbage, beans, peas and lettuce. The pool is very special, it is a natural pool made of natural materials and the water is filtered with salt and magnesium. The entire agricultural business is organic and so the owner has chosen to build a natural pool. Nice lakes to visit are Lake Vico and Bolsena lake. The agriturismo organizes cooking workshops, wine tasting, cheese and olive oil tasting and walking tours. 1. Cookery classes (in English) We organize thematic cooking classes in our brand new kitchen: homemade pasta, vegetarian dishes, typical Italian meal, and pizza. Usually a class lasts 3 hours with a glass of local wine. 2. Wine tasting We can arrange wine tasting tours to discover the typical and DOC wines of our area. 3. Cheese and olive oil tasting These activities can be held in our kitchen. We produce DOP extra virgin olive oil. Cheese is bought from locale cheese makers with own sheep. 4. Walking tour We organize on request walking tours in the Amerini mountains in spring and autumn, like the Monte Serra excursion (12 km). In summer we organize walking tours near the Bolsena lake and surroundings, including a boat trip to the Bisentina Island.